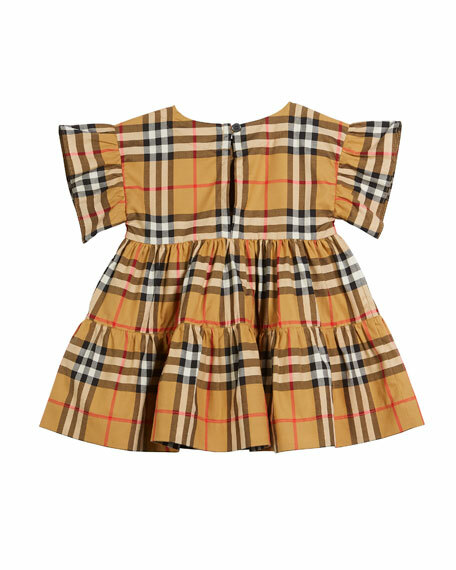 Burberry "Alima" dress in signature check. Burberry "Abia" knit pique shortall with striped trim. Kangaroo pouch with two-tone knight print. Bateau neckline; buttons at shoulders. Short sleeves. Kangaroo pocket. Snaps through legs. Cotton/spandex. Imported. Burberry "Crissida" dress in multicolored stripes. Spread collar; keyhole-button back. Long sleeves; button cuffs. Box pleat around waist. Elasticized waist with tie. A-line silhouette. Outer: cotton. Trim: cotton/spandex. Imported. Burberry "Cynthie" trench coat-style dress. Spread collar; double breasted button front. Short sleeves. Back flap. Shirred waist. A-line silhouette. Cotton/spandex. Burberry "Cynthie" trench coat-style dress. Spread collar; double breasted button front. Short sleeves. Back flap. Shirred waist. A-line silhouette. Cotton/spandex. Imported. 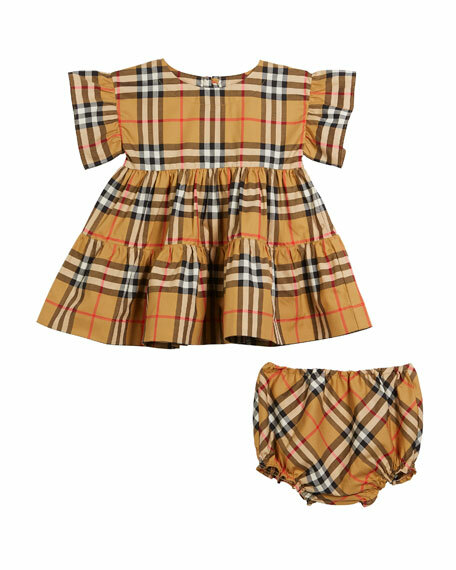 Woven "Dawny" dress in check by Burberry. Round neckline. Sleeveless; wide straps. Seam pockets at waist. Shift silhouette. Pleated skirt.